Question: What do you call a plant that is a tomato and a potato grafted together? A tomtato? A potmato? Answer: I don't know and I don't care. Potatoes and tomatoes are both closely related, they can be grafted to each other easily enough. With a little effort a chilli, tomatillo, potato, tomato, ground cherry, eggplant and a few other things including some agricultural weeds can graft onto one another as they are all closely related. If you could be bothered they could all be grafted onto a strong rootstock and a multi-grafted vegetable garden shrub could be created. Many varieties of each of these plants are perennial, so in theory if a hardy perennial root stock was chosen a grafted perennial vegetable plot in one plant could be the result. Yields would be low for each plant and care would need to be taken to ensure one graft did not take over the others, but it would be easy enough to create. Perhaps I should make one next year just to prove how simple it is. About 20 years ago I grafted the top of a tomato plant to the bottom of a potato plant. I did not have grafting tape or grafting clips but I did misappropriate some plumbing tape from school and used that. I had never grafted anything, I had never seen anyone graft, I had no one to answer questions or guide me, I had no books to read (and as far as I knew the internet did not exist) but I had heard about grafting so decided to give it a go. How hard could it be? I had hopes of getting two crops for the same amount of space and water. It kind of worked, I guess. I certainly got a crop of tomatoes, but the non grafted one in the next row cropped better. At the end of the season I certainly got a crop of potatoes, but the non grafted potatoes returned a far larger crop. Both crops tasted just as they should and looked normal. The grafted plant used quite a lot more water than I would have expected, much more than the tomato plants or the potato plants in the other rows. I considered it to be a failure due to the extra work resulting in lower crops an higher water for the same amount of space, in hind sight it was probably a success as the plant lived and cropped and I learned from the experience. Recently I have seen these grafted tomato/potato plants being sold. One very arrogant man claims that he is a genius who invented this process about 5 years ago. Too late, I did it 20 years ago when I was a teenager and I seriously doubt that I was the first to try this successfully. A few people claim that this method of grafting increases yields from both plants, unfortunately from my experience I do not believe them. You will get both crops, but the crops are both smaller. Larger crops from a grafted plant such as this is illogical. If you do not have much space and can only grow one plant then this trade off may be well worth it. I don't see the need to make erroneous claims, people will still buy the plants if you tell them the truth. I sell a lot of interesting vegetables, there is no need to exaggerate as people who want them will buy them. It would be interesting to see just how poorly these grafted potato tomato plants crop. I should run some field trials to see if growing potato and tomato in the same pot will yield differently to a grafted tomato potato. I wish I did not have to go to work so I had more time to do interesting experiments like this. I also have read about someone from a large plant/seed/gardening company who claims to have been the first to have ever thought of the idea 15 years ago (but never actually tried it until more recently), again I not only thought of this but successfully tried it earlier than that! If a teenager with no experience, no resources, no education or mentor can do this it can't be that difficult and I wish people would stop trying to big note themselves with such simple things. I honestly believe that people have been trying this and succeeding for a few hundred years but it has not gone anywhere as the yields are too low to bother. This type of grafting is simple, it is unproductive which makes it uncommon, being uncommon means that people have not seen it before and are often taken in by these lies. Perhaps next Spring I should run some grafting courses and teach people how to create these grafted plants at home. Enough of my rant (for now), I don't want to talk about grafting the top of a tomato the the bottom of a potato. I want to talk about the opposite. This year I grafted the top of a potato plant (called the scion) to the roots of a tomato (called the rootstock). You may ask why the devil would anyone do that, the resultant grafted plant would produce neither tomatoes or potatoes so would be a waste of time and space. Well it is simple, I wanted potato seed. Modern potatoes are grown from existing potatoes, they are genetic clones of their parent, it is essentially the same plant. Seed potatoes are just small potatoes, a stem fragment from the parent. I wanted to grow potatoes from seeds, true seeds, each and every one of them would be unique. Some would be dreadful, some mediocre and perhaps some would be great. I wanted to see if I could create a new variety that is better suited to my needs and will grow better in my climate. To do that the potato plant needs to flower, then it needs to grow fertile seeds, often a potato left to itself refuses to flower. Grafting onto a tomato will help to make this happen. When I was a child we had an unknown variety of potato that would set seed each year. I used to grow these seeds and nothing great ever came from them. Each seed grown plant was different, they grew differently, some had slightly different colours, but the parent stock was dodgy and did not have the genetic potential to grow anything truly great. I used to think it was my fault that nothing exceptional came out of that and felt like a failure, now that I am better educated I know that I actually achieved a lot back then. I have a variety of potato that never flowers in my climate. I don't know if it flowers anywhere. Many modern potatoes no longer flower. It is a great variety, it is easy enough to buy, but it struggles to crop well in this climate. When I have grown this variety in other climates and without exaggeration it has cropped about 20 times higher than it crops here (I weigh things and keep pointlessly accurate records). Planting certified virus free seed potato into new soil does not help, this variety struggles in my climate as it is not really suited to growing here. But it tastes so good which makes me want to grow it. If I could get some seed from this potato there is a chance I could grow a similar tasting potato that crops well here. To do that I need it to flower and set viable seed. This is a decent parent plant and has the genes to produce some exceptional new varieties of potato, but in the 7 or so years I have grown it I have never seen any flowers. 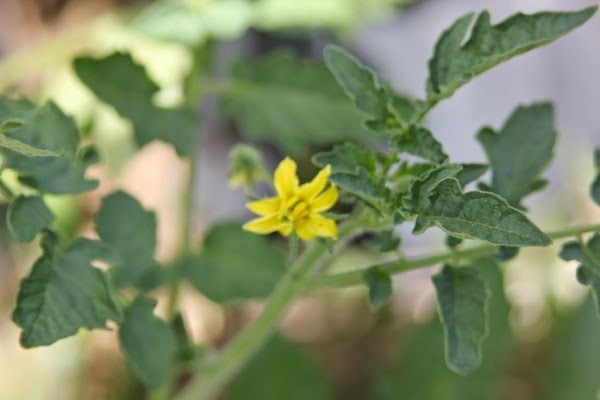 This year I grafted that potato scion onto tomato rootstock to induce flowering and hopefully convince it to grow fruit and set viable seeds. As the potato will not be putting any energy into tuber formation it will be more likely to flower and more likely to have the energy to set viable seed. I chose the most vigorous tomato I have and grafted them using 'tongue approach grafting' or 'inarching' as it is the simplest and most fool proof way to graft. 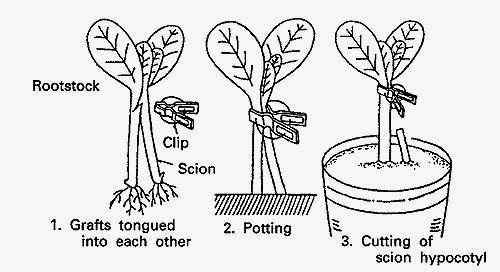 This is how grafting happens most often in nature, it is simple, fast to do and once done it is very low maintenance. I could have chosen other forms of grafting but why make things harder than they have to be. I grew a tomato seedling in a pot and the potato plant in the soil. When the plants were both the right size (ie it had nothing to do with size, it was when I could find the time) I put a small cut into each stem part way through. I then joined the two together and bound them with plumbers tape. I still do not have grafting clips or grafting tape, but the plumbing tape works well enough for me, this time I bought the tape instead of helping myself to it. Then I left the plants with two tops and two sets of roots so that the graft union could heal. Perhaps my description is not that useful, the picture above shows roughly how I did it, but my plants were larger and much older than in the picture. After the graft had taken (ie several weeks later when I found time) I cut off the top of the tomato and the bottom of the potato and was left with a grafted plant with tomato roots and potato leaves. The potato plant went on to continue growing and eventually produced a crop (which is why it was in the soil to begin with) and the top of the tomato was used as a cutting so nothing was wasted. I had a grafted plant in a pot which I planted into the vegetable garden. I then had a plant with the roots of a tomato and the top of a potato. I left the grafting tape on for another week or two then unwrapped it, the union was strong enough by this time and the tape was getting too tight. The tape could possibly be removed earlier but this works for me so I have not experimented with other methods. We are hoping to sell our house so I only grafted the one plant. I did not want to put in a lot of time to graft a lot of plants only to sell and move leaving behind treasures like this that would not be appreciated. Unfortunately we still are yet to find the right buyer, had I known this I would have planted a lot differently this year, hind sight is great. This grafted plant flowered well, extremely well. 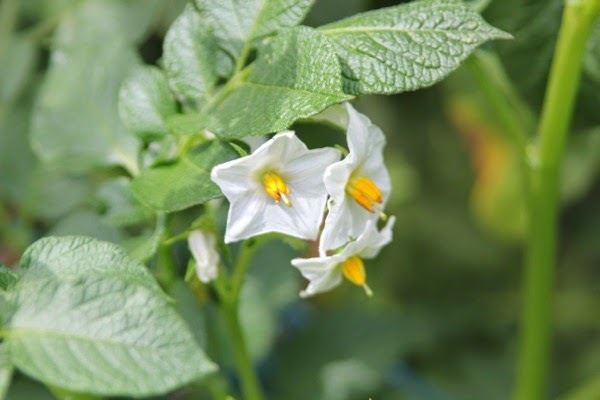 Considering that I have grown this potato variety for so many years and never seen a flower I think it is safe to conclude that grafting the top of a potato to the roots of a tomato actually does help the plant to flower. There are a lot of different pollinators around my garden, I never saw them on the potato flowers but they may have been there when I was not looking. I tried to pollinate the flowers in the same way that one pollinates tomato flowers, I think it worked. The plant started to produce fruit. This is exactly what I had hoped would happen. Then the ducks got in to the vegetable garden, they stomped around the garden a bit, broke a lot of plants, ate some leaves off things, messed around stealing vegetables and ate some fruit off the trees. The grafted potato/tomato plant was still alive but all the fruit was missing, I don't know if the ducks ate the fruit or if they rolled away somewhere. If they rolled away there is a chance they may grow next year but I doubt I will find them or even know that they are not just the normal potatoes. The grafted plant continued flowering for a while but those flowers all aborted and did not produce any fruit, probably due to the heat. If I try this again the next time I will try to graft a few more plants to help provide a little insurance against this kind of thing. Nothing much can be done now apart from wait. Since writing this post I have wondered if I should dig up the grafted plant and try to overwinter it. I know the tomato rootstock can survive if I protect it from frost but I am not sure about the potato part. I wondered if it was worth my time even trying, perhaps it would flower and set seed better, perhaps it would simply die, I don't know anyone who has tried to keep a plant like this alive for several years. Come to think of it, I don't know anyone who has created a grafted plant like this one. Once again the ducks got into the vegetable garden, they kind of made up my mind for me. The top of the plant is now dead/missing, the roots are possibly still alive, if they sprout leaves I will let the frost kill it when it is time. This type of grafting is worth another try if I have any land next year as it seemed to help the potato to flower, once I get this potato variety to produce viable seed then the fun part begins. Perhaps I should get a different type of potato that flowers and fruits readily and cross them. For now I am happy that grafting helps flowering and fruit set. Does anything weird happen when you graft them together? Strange taste or mutant leaves? Sometimes an odd taste can be present in tomato fruit and/or potato tubers, normally it is not too different or unpleasant though. It is the lower yield that makes this kind of grafting less common. It is simple enough to do this graft, it is not done commercially or by home gardeners very often as it is simply not worth the effort. The rootstock changes anything you graft onto it, but normally it is not too noticeable unless the roots have vastly different chemicals to the scion. 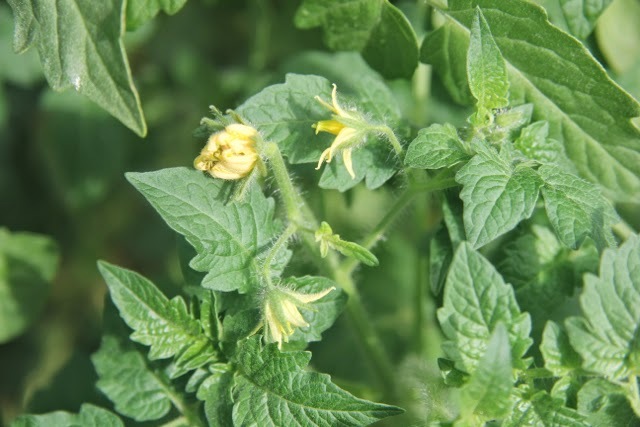 For example when tomato scion is grafted to tobacco roots some nicotine is translocated into the tomato fruits as well as the stems and leaves. I am told if jimson weed is used as the rootstock that toxic alkaloids will be present in the fruit. In the reciprocal graft (tomato roots and potato top as I did above) sometimes the potato will grow starchy growths in the leaf axils and along the stems. That makes sense as tomato roots do not form tubers and potatoes are stem tissue as opposed to root tissue. To make your experiment work might take some time. Little potato clones take a significant amount of time to grow, already, even off the parent plant -- you won't know what they taste like until they grow in... you would have to remove eyes from them before cooking them to determine how they taste... and even then you would not know how well they grow, yet... to make it work I think you would need to supercharge the soil, in order to push them to grow as fast as possible. Otherwise the scope of time needed to determine whether you got a good potato or not is too long, even for most patient people. I couldn't disagree more about the time being too long for an average gardener, let alone for a patient one. The timeframes involved are really rather short. I assume that you have never been involved in any form of plant breeding, but as potatoes are perennial it actually takes far less time to create a new variety than it would something like a tomato or sweet corn as you do not have to spend years stabilising them and they can remain in the heterozygous state. I have bred new varieties of both tomato and corn and am part way through breeding more so have a bit of experience. Due to the polyploid nature of potatoes, and the fact that the ones I can buy from the shop are generally heterozygous, it means that every seed I grow will be genetically different from the rest. There is a bit of luck finding the right combination of genes. Most seed grown potatoes are substandard, but you work that out the first or second year and remove them. To illustrate how quickly a new potato variety could be produced via true seed, this link http://garden.lofthouse.com/images/potatoes-landrace.jpg shows a picture that Joseph Lofthouse took. He planted some true potato seed and each basket is the result of one year's growth from one seed. As you can see, there is a lot of diversity and some seeds produce more than others. From here you would decide which one works best for you, plant the tubers, and essentially you have a new potato variety. No back crossing to lock in traits, no isolating plants, you simply need to build up numbers. There may be problems with seed grown potatoes including daylight sensitivity issues, or cytoplasmic male sterility, or seed/tuber dormancy length, or potential toxicity (long story here), or having space to grow out different varieties for evaluation, but these are not the biggest issues. The main problem one of virus load and disease build up. Unless you are able and willing to do meristem tip culture or some other method to rid them of disease every year or so you run into trouble with disease build up. But that is a story for another time.